How can he forget the past when it’s out to kill him? Former special-ops soldier and now an analyst for the think tank Vektor, Max Anger would kill to move on from the scars of his past—if only for the sake of Pashie, his girlfriend and fellow operative, who wants out of the battle zone. For them, a normal life is just one more dangerous uncertainty. Especially now that evil is hitting closer to home. 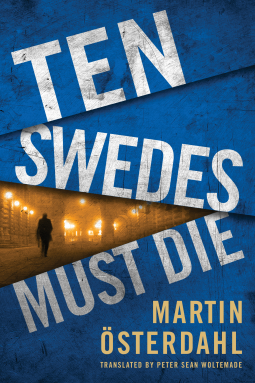 Sofia Karlsson of the Swedish police wants Max’s help in a high-profile and high-stakes murder investigation: the hunt for a serial killer stalking the streets of Stockholm, who’s eliminating his victims in gruesome and tantalizingly clever ways. When Max discovers his connection to two of the crime scenes, his investigation uncovers what could be the most shameful episode in Sweden’s history. The deeper he gets, the harder it becomes to distance himself from the dark sins of the past—and to secure a future with the woman he loves. For Max, and for the killer, the countdown to a terrifying end begins. Martin Österdahl has studied Russian, East European studies, and economics. He worked with TV productions for twenty years and was simultaneously the program director at Swedish Television. His interest in Russia and its culture arose in the early 1980s. After studying Russian at university and having had the opportunity to go behind the Iron Curtain more than once, he decided to relocate and finish his master’s thesis there. The 1990s were a very exciting time in Russia, and 1996, with its presidential election, was a particularly crucial year. Seeing history in the making inspired Österdahl to write the first novel in the Max Anger series, Ask No Mercy. The series has been sold to more than ten territories and is soon to be a major TV series.